ApolloBravo specializes in fully integrated retail promotions that engage customers with quality mobile experiences including sweepstakes, games, contests, surveys, and events. 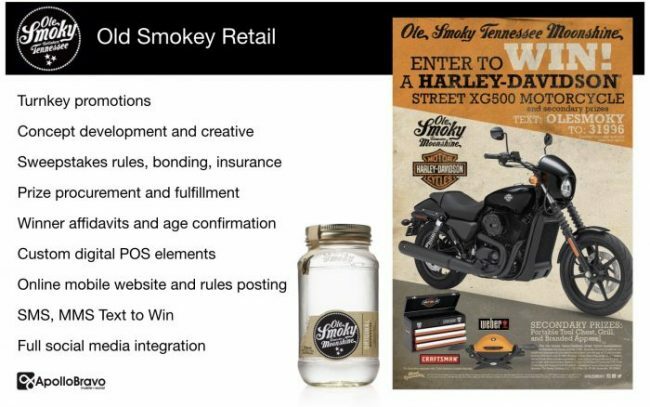 We have over 20 years experience running turn-key retail promotions, concept development, sweepstakes rules, prize procurement, and fulfillment, with digital and mobile marketing integration. Do you need help executing a national retail promotion with a major chain? ApolloBravo is experienced to execute all types of major retail promotions flawlessly.